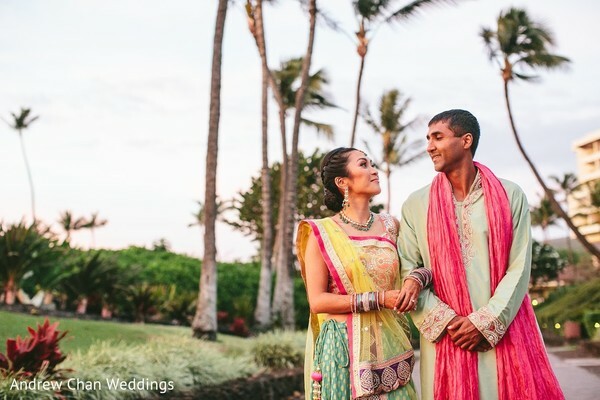 Grab your passports because we are off to Maui, Hawaii for this dazzling Destination Indian fusion wedding, planned by Mira Savara Events! 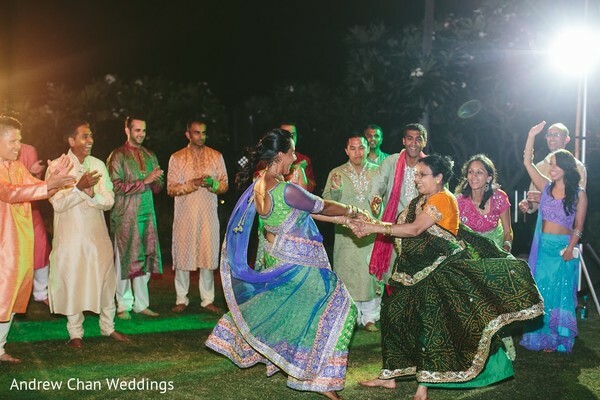 We're going to start things off with a look at the sangeet fashion and celebration! Andrew Chan Weddings catches up with our adorable couple, showing off their finest pre-wedding threads! 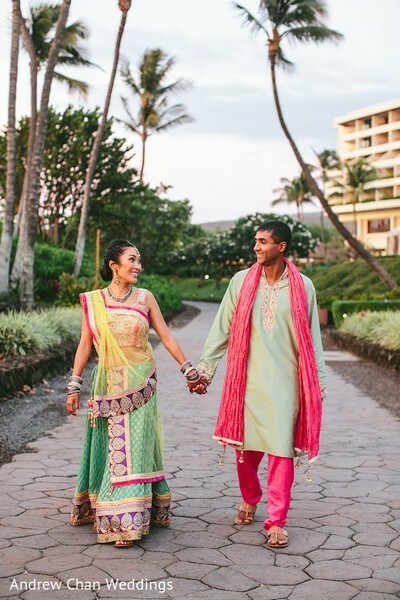 Our Chinese Maharani is pretty as a picture in a colorful lengha, with first-class hair and makeup by Maui Makeup Artistry! I am loving her darling updo which accentuates her high cheekbones! 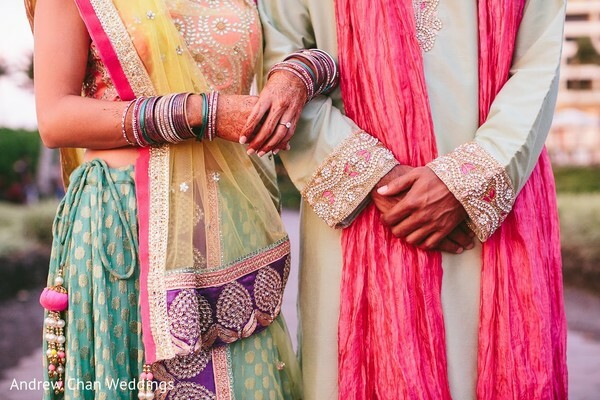 Her doting Gujarati hubby-to-be looks great by her side in a mint-green sherwani! There's so much more coming up, including beautiful bridal fashion courtesy of Studio East 6, but meanwhile, check out the gallery to see more details of this fine day! 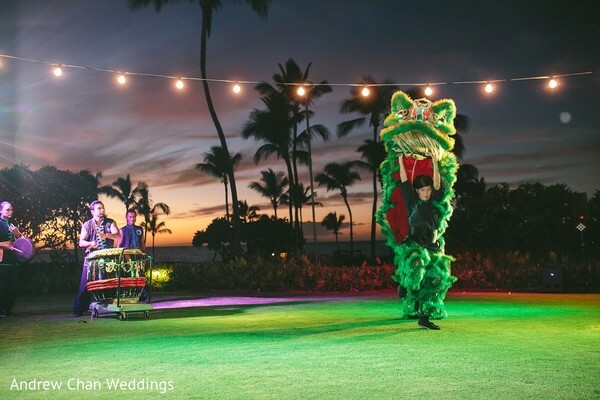 "One of my favorite moments was at the Welcome Luau... my (now husband) proposed to me again... I had told him a while ago that during his proposal I was so overwhelmed with shock and happiness that I couldn't even hear half of what he said. So he surprised me at the welcome party by proposing to me again! I cried a little less the second time but definitely tried to listen harder than the first." The ceremony shots are up next! Mira Savara Events, Studio East6 and Manutea Nui E are members of the Platinum Guide. Love what you see? Explore their portfolios.